Compact 1949 Ford Vedettes roll off the line in Poissy, France. When peace came in 1945, North Americans would be ready for smaller vehicles than before. At Ford, the first benchmark used to design its pint-sized compact car was the 1942 Willys. The dimensions of the new Ford would be similar and a competitive price was highly important. 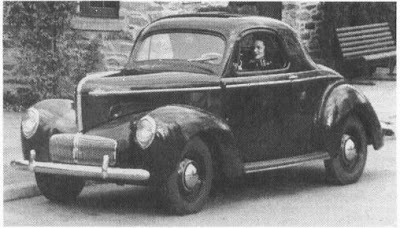 Then executives decided to reposition the vehicle and based its small car package on the successful, but not so small Studebaker Champion. By 1944 the project was assigned to the Engineering Planning Committee which was responsible for new products. Since none of the existing small Fords produced anywhere in the world were suitable for the home market, a green light was given to build a new car from the ground up. Engineers studied many different power plants. A transverse-mounted, four-cylinder engine was tested in conjunction with front-wheel drive. Henry Ford submitted an in-line, five-cylinder motor that he'd created in his personal lab. Sixes, eights and fours were all examined, some air cooled while others featured aluminum blocks. Once the engineering package was defined, it was time for the body to take shape. Eugene (Bob) Gregorie was Ford's in-house styling guru. 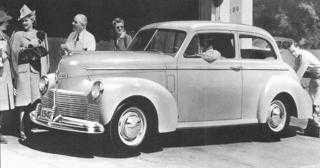 His efforts bore a strong family resemblance to the senior Ford line with heavy sculpturing in a slab-sided envelope. By mid-year 1945, the five-cylinder engine was dumped for a V-8. 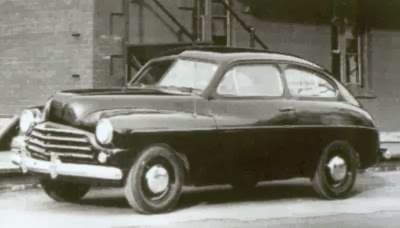 A new chassis was then created from the one under development for the 1949 model year. The car was given high priority; it was to be ready for dealers within months of the war's official end. That is when the vehicle's drawbacks became apparent. It wasn't a small car, despite its 100-inch wheelbase. It was heavy because it used existing components right off the shelf. Gas mileage was poor, even in the days of 15c-a-gallon gas. Price was within 20% of existing Ford products and since no one knew how the car would be accepted by the public, the project was put on hold. Resurrected as the Light Car Program, a 106-inch wheelbase prototype was created for Ford and a 112-inch variant for Mercury dealers. Introduction was delayed yet again, this time because of severe material shortages. It looked as if the car might be dumped again when the president of Ford in France saw the production prototype during a visit to Dearborn. 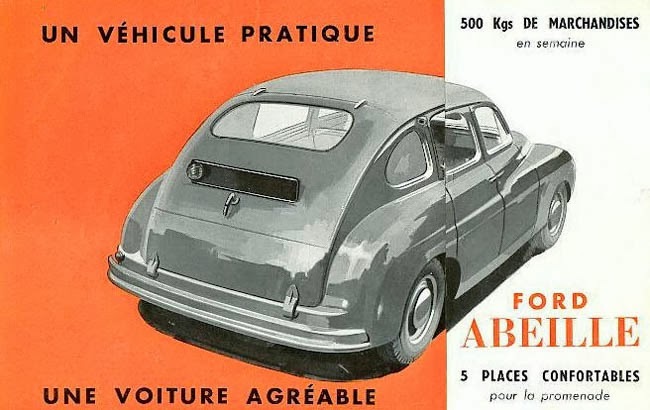 The little car was shipped to the Ford factory in Poissy, France and retooled for metric specifications. Rolling out of the factory doors as a '48 model, it was christened Vedette, which translates as 'movie star' or 'celebrity.' The Ford name was severely downplayed on the car and in sales literature. It was expensive to buy and expensive to run. 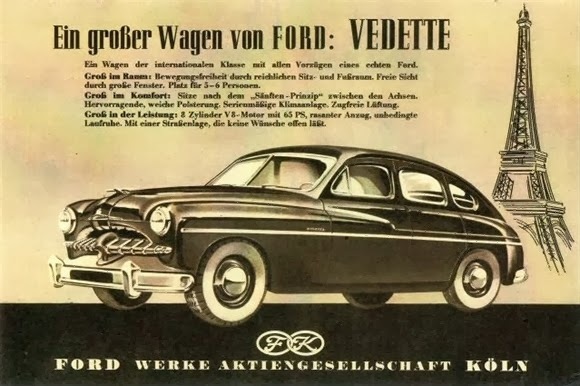 Despite sales to other European countries, Vedette was a poor seller. 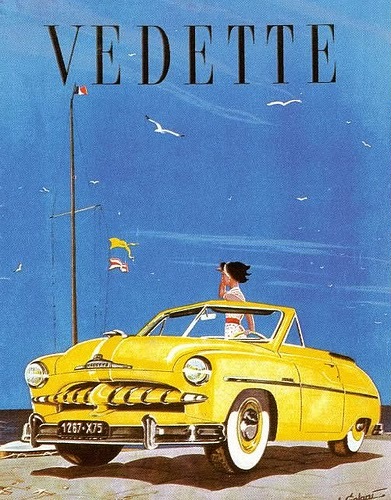 Even the addition of a sharp convertible didn't help Ford Vedette sales in 1951. 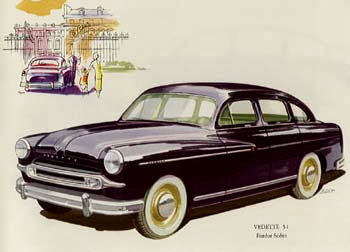 The 1953-54 Ford Vedette was given an attractive facelift. Introduced in 1952, the Ford Abeille carried five passengers. Its unique two-part tailgate and its 500-kilo capacity made it practical for farmers. 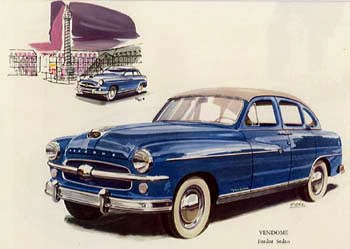 The 1954 Ford Vendome shared its shell with Vedette but boasted Ford's 4-litre, Mistral V-8 engine. 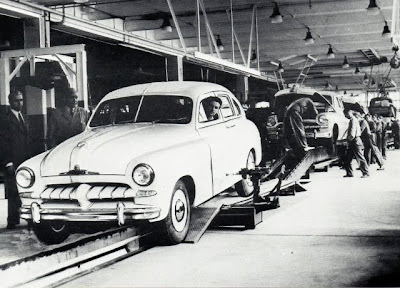 Ford merged its French operation into that of Simca in 1954. 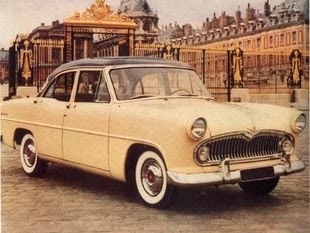 The Simca Vedette Versailles (above) continued to be sold under the Ford name in countries where the Simca brand was not as well known as Ford. Copyright James C. Mays 2001 All rights reserved.